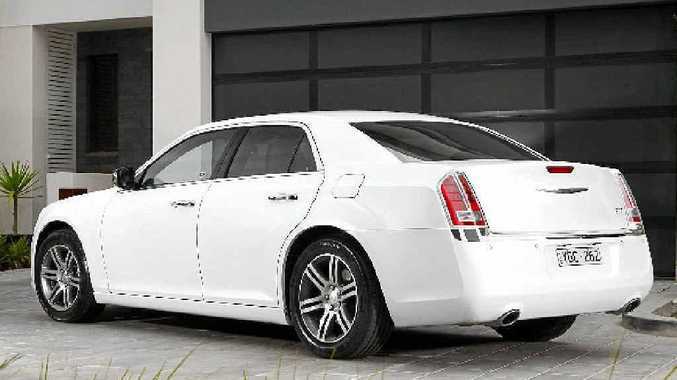 Chrysler's 300 range remains distinctive but now boasts more executive styling. AUSSIES have pretty simple tastes when it comes to large cars - you were either born into a Holden family or a Ford one, and for decades nothing else got a look in. But the perfect storm is brewing around the Commodore and the Falcon, with buyers deserting the segment in droves in search of newer, smaller cars and SUVs. Now, just to add further insult, a brash American has just wheeled off the boat and is intent on vacuuming up the remaining buyers in the segment. The new Chrysler 300 looks at first glance much like the old one, with the squared-off three-box shape, ultra-tall hipline and tiny glasshouse that made the previous one a cult hit. The 300's face is now more corporate - or, less polarising - but still distinctive enough to be aspirational. Value is significantly beefed up with a long list of standard inclusions. After a day-long acquaintance with various models of the 300 range, the only chink in its impressive armour appears to be its starting price, with the base 300 Limited model kicking off at $43,000, or $3010 more than a Commodore Omega and $5765 more than a Falcon XT. But that impression lasts only as long it takes to peruse the list of standard inclusions across the 300 range, which includes dual-zone climate control, proximity key entry and push-button start, an 8.4-inch (21.3cm) touch screen, powered steering wheel adjustment, front and rear parking sensors, a reversing camera, leather-wrapped steering wheel and gear knob, a driver's knee airbag, and swivelling and self-levelling headlights. The seats are big and comfy, although lacking lateral support on the base 300 Limited model. Leather-clad pews in a 300C model are more cosseting. Perhaps most impressive of all is the cabin ambience, with significant work on sealing and insulation resulting in suppression of road, tyre and engine noise that is at least the equal of many significantly more expensive luxury cars. Buyers of the 300 can choose between a petrol or diesel engine on the 300 Limited, 300C and 300C Luxury models, with the turbo diesel unit adding $5000 to the price. It's hard to justify that additional expenditure after driving the 3.6-litre "Pentastar" petrol V6, which is likely to be the volume seller. It doesn't leap off the mark in the same way as a Falcon or Commodore does, but steadily piles on the power with a V8-like exhaust note above 5000rpm that neither of the locals can emulate. The 3.0-litre turbo-diesel V6 - the same engine that powers the Jeep Grand Cherokee that last year was voted Drive's best four-wheel drive - is also a refined yet unhurried unit. Diesel clatter is all but absent and a large pool of torque provided effortless shove on a hilly drive around Victoria's Gippsland region. On our drive the petrol engine averaged 10.9L/100km (official combined figure 9.4L) and the diesel returned 9.6L (official 7.1L). The hero of the 300 range is the SRT8 fitted with a whopping 6.4-litre V8 making HSV and FPV-beating figures of 347kW and 631Nm. Our access was limited to carefully lapping a rainswept racetrack at Phillip Island, with all that power channelled through the rear wheels creating a recipe for frequent lairish oversteer and little else.